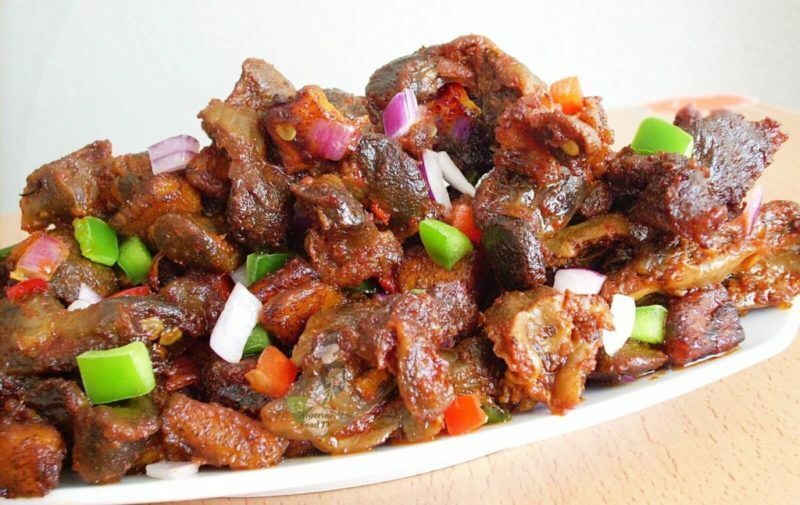 Gizdodo is a coined name for a Nigerian dish prepared with a combination of gizzards and plantain (dodo). The sweetness of the plantain and the crunchiness of the gizzard seem to do an amazing job as a crowd pleaser. This side meal goes best with a plate of rice or a pasta dish as its delicious taste blends with them to create a tasty fiesta on your buds. 1. Marinate the gizzards with vinegar, salt, chopped onions and seasoning cubes and then boil until tender. Proceed to fry or grill in the oven (but for a healthier option grill the gizzard). 2. While the gizzard is grilling, cut the plantain into cubes and fry until golden brown then set aside. 3. Also chop the onions, red bell pepper, and green pepper. be careful with the volume of green pepper though, 1/2 to 3/4 of one is enough otherwise it will introduce some bitterness to the stew, which can be unpleasant. 4. Blend half an onion, scotch pepper, 4 large tomatoes, ginger and garlic to form a smooth puree. Boil this until it reduces and most of its water content has evaporated. 5. Take out some of the oil used to fry the plantain/gizzard and pour in a deep saucepan. Add the curry powder, dried thyme and fry. 6. Add the chopped pepper and the blended tomato mix to the pan. 7. Add the gizzards and chicken stock and then allow cooking on low heat till it thickens. 8. Finally, add the golden brown plantain and stir. “Aaaaaaaand” there’s your Giz Dodo, ready to be scooped into big dip bowls and passed around for your guest! For all our dodo lovers, we encourage you to give this delicacy a try and you might love it enough to make it every weekend.